In an effort to unite and honor those amongst Alberta’s African, Caribbean and Afro-Canadian communities that have achieved greatness in their respective domains, the Black Gold Awards of Alberta is organising its first annual awards ceremony to be held September 27th, 2013 at the EPCOR Center for Performing Arts. 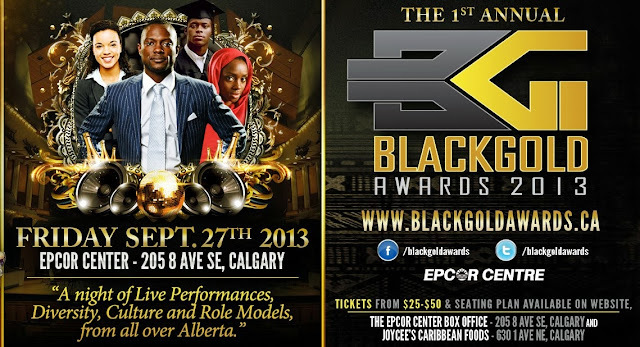 This event will be a full feature awards ceremony showcasing the very best of African, Caribbean and Afro-Canadian culture and achievement. This formal event will also create a forum on which all of Alberta’s communities can come together and celebrate the best and brightest amongst us. It will become an epicenter to network, create unity and instil a sense of pride in our young people, empowering them to pursue their dreams. As Albertan’s, ‘Black Gold’ is representative of the oil rich lands we all currently share today. A portion of the proceeds from this event will be going to the Alberta Flood relief. I am honored to have been nominated for " Entrepreneur of the Year" and my business Joyce's Closet has been nominated for " Small Business of the Year"